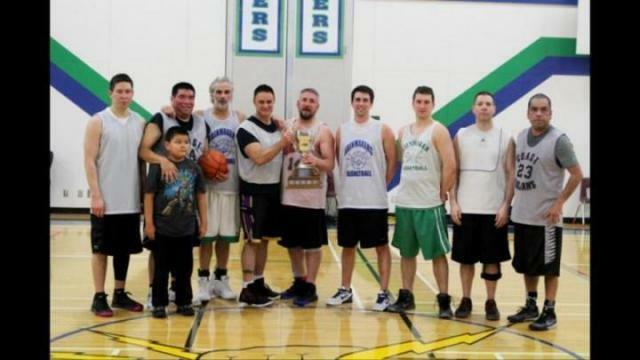 It’s a different year, but the same champions as always in the Rainmakers Alumni Tournament at Charles Hays Secondary School on the weekend. It’s a different year, but the same champions as always in the Jim Ciccone Memorial Alumni Tournament at Charles Hays Secondary School (CHSS) on the weekend. The 1946-2002 Rainmakers dominated the competition enroute to at least its tenth straight championship, although no one knows exactly the last time any other team won. Ryan Bishop, assistant coach to the CHSS senior boys team, and his team beat the 2003-2009 Rainmakers 89-73 for the trophy. “I can’t even remember the last time we lost. We’ve won for awhile and they’re looking to knock us off,” said Bishop with a laugh after the game. The 2003-2009 Rainmakers actually got a head start in the game, leading 21-13 after one quarter of play but the older Rainmakers dominated the game for the final three quarters. “We just have that old man smarts. We move the ball pretty well,” Bishop said. It didn’t hurt that his team has some skilled players from back in the day, who still haven’t lost it. Ryan’s brother, Brody, is a perfect example of that. The younger Bishop put on quite the show in the championship game, draining a total of 49 points, including an impressive eight three-pointers. “We got a guy like Brody who can shoot the ball like crazy so it always helps when you got a guy that played overseas,” Ryan said. Brody also had a 56-point game in the tournament, so he brought his A game. Ryan kicked off the game with a three pointer, one of a trio he drained in the game, but the 2003-2009 team rallied to take the lead after one frame. But it was a different story the rest of the way. The elder Rainmakers outscored their opponents 25-9 in the second quarter to hold an eight-point lead at the half. In the third, Brody was on fire, seemingly scoring a basket every time the ball found his hands. He scored 18 points in the third quarter alone and the 1946-2002 team stretched its lead to 20. The 2003-2009 made a few advances in the fourth quarter, but it wasn’t nearly enough in the good-natured championship game. The alumni tournament included six teams: 1946-2002, 2003-2009, 2010-2013, 2014-2016, the junior team and the senior team. The idea is to bring Rainmakers past and present together and help the memorial fund, which supports basketball scholarships. The weekend was also a fundraiser for the senior team. The senior boys team finished third in the tournament, defeating the 2010-2013 team 82-62. The 2014-2016 Rainmakers placed fifth and the junior boys team in sixth.